Try our Bloodstone Spheres Satisfaction Guarantee - compare our prices and our superior quality. Click on any genuine bloodstone sphere image below to enlarge it. This unique bloodstone egg (also known as heliotrope) is a natural green jasper with tiny "drops" of red jasper here and there throughout the egg. This collector quality egg was handcrafted from natural color bloodstone rough that was mined in India. It has an excellent polish. See also an opposite side view of this handcrafted bloodstone egg. This unique bloodstone sphere (also known as heliotrope) is a natural green jasper with tiny "drops" of red jasper here and there throughout the sphere. This collector quality sphere was handcrafted from natural color bloodstone rough that was mined in India. It has an excellent polish. See also an opposite side view of this genuine bloodstone sphere. This unique bloodstone sphere (also known as heliotrope) is a natural green jasper with tiny "drops" of red jasper here and there throughout the sphere. This collector quality sphere was handcrafted from natural color bloodstone rough that was mined in India. It has an excellent polish. Our Bloodstone Spheres are all natural color bloodstone, with no treatments of any kind! 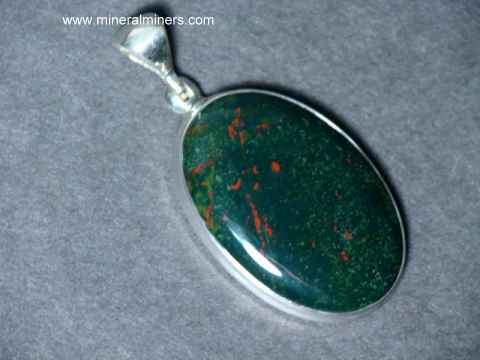 Natural bloodstone is green chalcedony or jasper with small spots or "drops" of red jasper. Each one of our bloodstone jewelry items was handcrafted into a unique 925 sterling silver jewelry design. To see more bloodstone jewelry photos, simply follow any of these linked bloodstone jewelry images. Would you like us to inform you when we add on this page more natural bloodstone (also known as heliotrope) spheres and bloodstone eggs? We do have additional inventory of natural bloodstone items in stock, so be sure to let us know if you have any genuine bloodstone special requests. 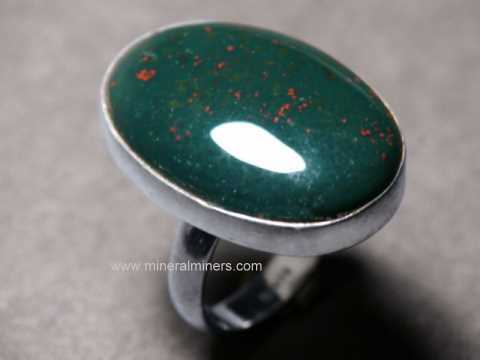 Please contact our webmaster or our 'site' geologist with any bloodstone questions or comments.